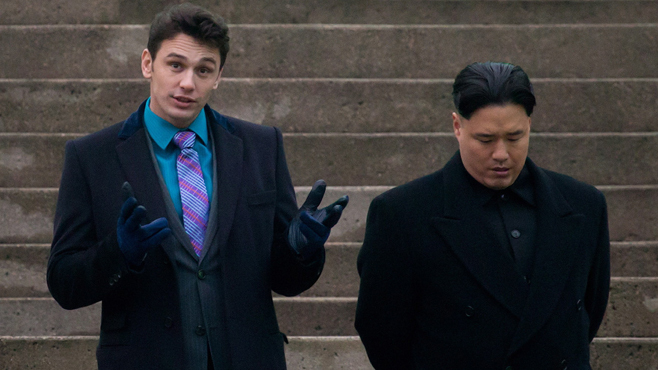 The Interview stars James Franco and Seth Rogen as a TV talk show host and producer, respectively, who manage to book an exclusive interview with North Korean dictator Kim Jong-un. But then the CIA approaches these characters, Dave Skylark (Franco) and Aaron Rapaport (Rogen), and ask them if would they please assassinate Kim Jong-un when they have a chance? The inherent gag is apolitical: two normal schlubs enlisted to be secret agents out of circumstance, not ability. And of course they screw it all up, making an already impossible situation even more impossible. But the context makes it an inherently political film: two regular citizens with no particular agenda are now forced to commit an arguably unethical act in the name of national security, forcing them to decide for themselves what they believe in and how willing they are to actually act on those beliefs. And the dramatic structure of The Interview is (almost) remarkable, from the arch set-up to the intriguing reversal: that Kim Jong-un is just another guy, albeit an arguably evil one. It’s a turn which makes one of our heroes decide not to commit murder. And then yet another reversal: that humanizing your enemy is even more of an assault than actually murdering them. The Interview makes a valid point over the course of the majority of its running time, elegantly set up and nearly followed through, about the power of propaganda to both empower and to destroy. 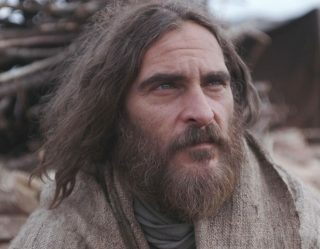 And then of course the whole film mucks it up with an ending that sends the most mixed message possible, resorting to violence anyway, and engaging in wholesale propaganda whilst simultaneously condemning the film’s own actions. It would almost be a canny way to have their cake and eat it too, if The Interview were deft enough to comment on just how egregiously the filmmakers were negating their own message. But the film relies a little too heavily on punishing America’s enemies, letting the destructive Americans off the hook, and engaging in some very unpleasant Asian stereotypes to get away with its own conclusion. What’s more, that deft structure (deft, that is, until that finale) is largely obscured by the constant riffing of its stars. James Franco and Seth Rogen have great chemistry together, as already proven in Pineapple Express, but here their constant non sequitur banter only gets in the way of the story. They aren’t playing stoners with no motivation this time. 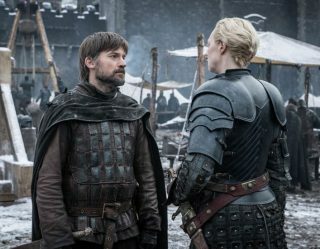 They are playing highly motivated characters in a situation that’s far more interesting to actually watch play out than it is to see Rogen and Franco belt out Lord of the Rings references… which they do, constantly, when they should be taking action instead. 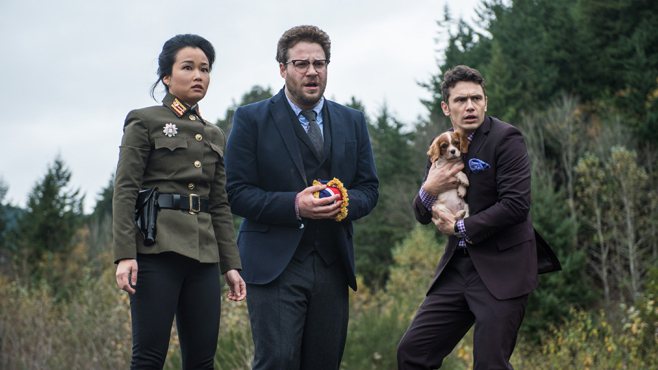 The plot of The Interview is left tapping its feet, waiting for Rogen and Franco to simply – in the words of Monty Python – get on with it, instead of smirking at their own ad-libbed wackiness. 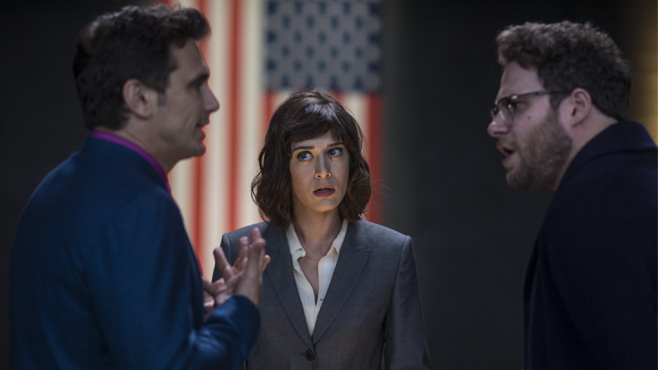 As subversive as the plot is, as well intentioned as the film’s moral tries to be (again, before shooting itself in the foot), The Interview finally reveals itself as… just another dumb comedy starring Seth Rogen and James Franco. Kinda funny but never outright hilarious, way too long and for no good reason. 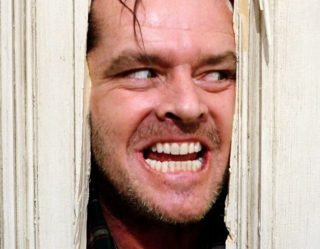 There’s a story hidden underneath all this incessant riffing that could have made a poignant statement about modern politics and celebrity if the movie had dared to actually follow it through, but the need to add an over the top, “satisfying” conclusion to The Interview robs the film of its higher purpose. And it’s just not amusing enough to live up to its baseline purpose: to consistently entertain.